Habitat: Horehound is native to Europe, Asia and northern Africa. It can be found on nutritient-poor, dry and sandy soils. 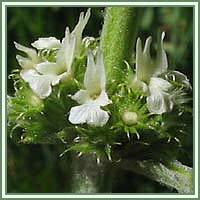 Description: Horehound is a herbaceous perennial plant. It grows up to 45 cm in height. The leaves are gray, small and oval, with a crinkled appearance. Downy white hairs grow on the underside of the leaves. Lower leaves appear on the long stalks, and the upper leaves grow smaller and without stalks. The flowers are small and white and borne in dense clusters. Blooming period lasts from June to August. Two-lipped tubular flowers appear on the upper part of the main stem. Seeds are small and shiny, with little barbs that attach to the animal fur. Useful components: Marrubium-bitter principle, mucilage, resin, tannins, fat, volatile oil, wax, sugar. 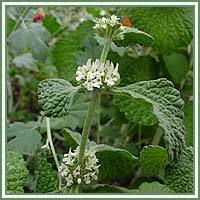 Medicinal use: Horehound is mainly considered to be useful as an expectorant and antitussive herb. It can also be employed as a mild laxative and gastric tonic. It has long been used as cough suppressant and as a very helpful remedy against common cold symptoms. It is also very famous as a herbal medicine used for acute and chronic bronchitis, asthma, chest, nasal and sinus congestion, coughs and chest complaints, respiratory infections and sore throat. It is also very useful in treatment of cardiac arrhythmia, diabetes, bowel, gallbladder and uterine disorders. Horehound is beneficial as a gastric tonic, useful in cases of loss of appetite and flatulence. Used externally, it can be an efficient wound cleanser, and can help in cases of both temporary and persistent skin disorders. Safety: Some herbs could interact with certain medication. Therefore, it is highly advisable to consult your doctor/herbalist before consumption of any herb.